A useful diagnostic test should provide information that helps to discriminate between competing hypotheses. But any practical diagnostic will be imperfect: both false positive and false negative indications are to be expected. So just how useful is a diagnostic test when it is, necessarily, imperfect? 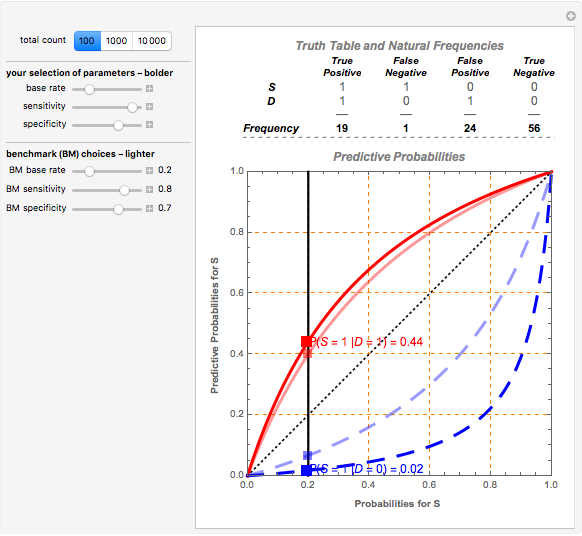 In , p. 44 shows a static, graphical example of how Bayes's theorem may be used to understand the factors determining the discriminatory power of diagnostic tests. This Demonstration is a dynamic version of that argument. 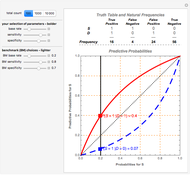 The discriminatory power of diagnostic information can be measured by the levels and differences between two inverse conditional probability assessments, and , one for each possible diagnostic test result. This interactive Demonstration creates a graphical depiction of the inverse probabilities and as functions of the underlying sensitivity, specificity, and base rate inputs. A natural frequency representation of the full joint probability distribution over the random variables ( , ) is provided in a truth table format above the graph, where the column entries are frequency counts or "cases" in a hypothetical population of a fixed size. 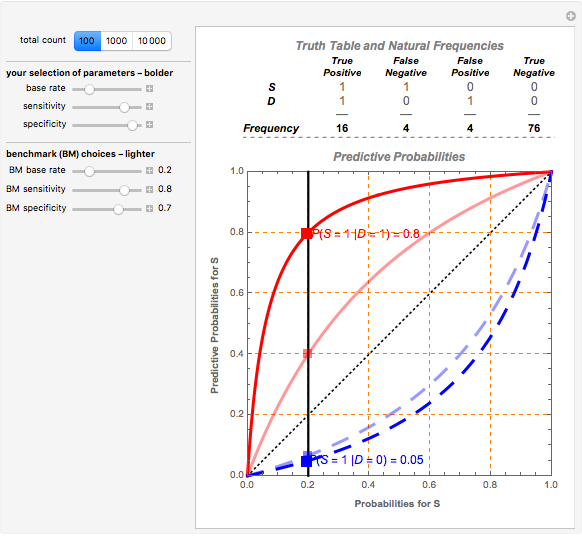 A richer explanation of Bayes's theorem in the 2×2 case is available in the Demonstration Bayes's Theorem and Inverse Probability. 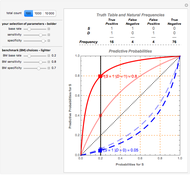 A comprehensive explanation of the natural frequency method of representing probability distributions in the 2×2 discrete case is available in the Demonstration Comparing Ambiguous Inferences when Probabilities Are Imprecise. J. M. Bernardo and A. F. M. Smith, Bayesian Theory, New York: John Wiley & Sons, 1994. John Fountain and Philip Gunby "The Discriminatory Power of Diagnostic Information from Discrete Medical Tests"